Each year the Mountain Ramp Festival attracts thousands of visitors who range from the Miao people to tourists from China and beyond. The festival itself is steeped in Miao tradition and recreates the journey of the Miao from the eastern coast of China and resettlement in the west hundreds of years earlier. Just as the Miao once journeyed in pursuit of their livelihood, visitors from neighboring villages experience the similar trip uphill by foot and by automobile. The festival centers both symbolically and physically around a tree that is selected and ceremonially chopped down by local leaders who then carry it up the mountainside to its place at the center of the festival stage. Trees are revered within Miao culture, and they represent energy and life. Upon the conclusion of the festival the tree is taken to a remote location to ensure that nobody will find it and bring bad luck to the Miao. On the lunar February 15th in every year, there is a big festival in the Nankai Village, Lupanshui City in the Guizhou Province. 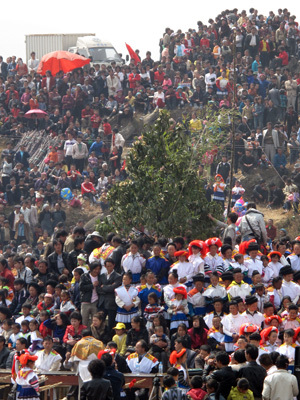 This is the biggest and most traditional festival for the local Miao people (Little Flower Miao). Thousands and thousands Little Flower Miao gather in the village dressed in their beautiful traditional costume. They sing and dance to celebrate their favorite festival. Every year, the whole family, dresses in the colorful costume and brings food, attend the festival. Everyone walks from different places and climbs all over the mountains for this gathering. The quiet Nankai village becomes busier than usual with moving heads outlining the two saddle-shaped mountains. Young people dance and play the reed-pipe wind instruments. They talk about love and dating. Elders meet their old friends and relatives. They talk about their living in the past year while they are eating fatty pork and white rice that are kept in their plastic bags. Old ladies also sing their own sadness song to share their loneliness and tell each other their hard working in the past year. 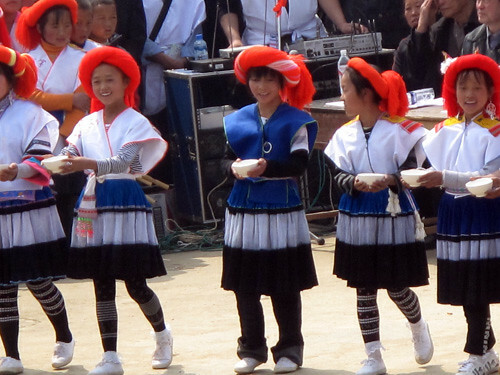 In this festival, Little Flower Miao use singing and dancing to express their feeling. Little Flower Miao is a division of Miao. Most of their farms are on the mountains. They mainly grow corn, bean, tea, and potato. Little Flower Miao’s costume is very colorful. They tie all their hair up on the head with red cashmere yarn as decoration. The back cover blanket/ apron is the most distinguishing part of their costume. The blanket is made from yellow, red, and black yarn. Yellow is the main color. Red is inlaid as the border while black is hooked throughout the whole blanket. Such an exaggerated use of color, from their blanket to the skirt, represents the unique characteristic of Little Flower Miao.